OK I know the title of this post will probably make you laugh right now, but hear me out! I know the thought of warmer weather is a long shot right now but one thing which I know is very typical of British weather is how unpredictable it can be! It totally caught me out last year, one day I remember wearing demin shorts and a vest, the next day I wore jeans and a jumper. Don't you just love Britain? 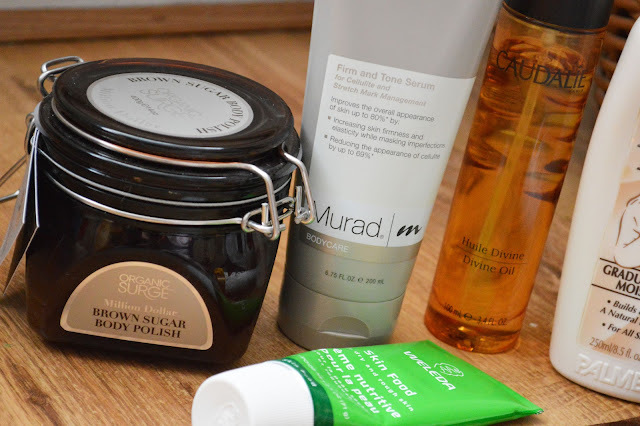 Anyway this year I don't want to be caught out, so I've updated my current body care routine which lets face it probably only consisted of a body cream and treatment oil previously. This is the Caudalie Divine Oil, I have mentioned this many a times on my blog. It smells amazing, it feels amazing on the skin and it comes in a spray! Yes a body in with spray- genius right? Plus it can be used all over the body. I normally spritz a few sprays on drier areas and always a spray on the arms because I love smelling of this! I'm no spring chicken and not forgetting I've been blessed with two beautiful healthy children, my body isn't what it use to be. I know we probably all have at least one problem area on our body which we would like to improve. This happens to be my thighs, I have stretch marks and cellulite YEP! A double whammy! 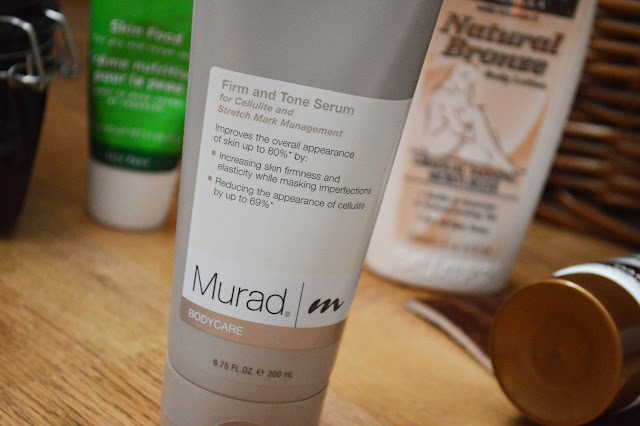 So the key product in my updated body prepping routine is the Murad Firm and Tone Serum* 200ml/£63. I have been using this for a few weeks now and can honestly say I'm noticing a difference. It may be small BUT it is definitely an improvement. I use this solely on my thighs being my worst problem area. I love to wear shorts in the summer and will hopefully be wearing a playsuit or two this summer. So by introducing this treatment now, I am hoping by the time the warmer weather visits us my skin will overall look and fell better. Therefore I'm hoping I will feel more confident having my thighs on show. These types of products don't just magic overnight, you have to remember to use them to see the changes. The formulation is a gel which sinks right into the skin, the scent is pleasing and actually reminds me of the summer in a weird way. All I can say is I'm using it and I'm seeing results. So after using the body scrub, body oil and treatment product (optional ) I then opt for a self tan or gradual tanner. Now I'm sure you were all Johnson & Johnson's Holiday Glow fans but thankfully times have changed and there are heaps of gradual tanners on the market which actual smell nice. 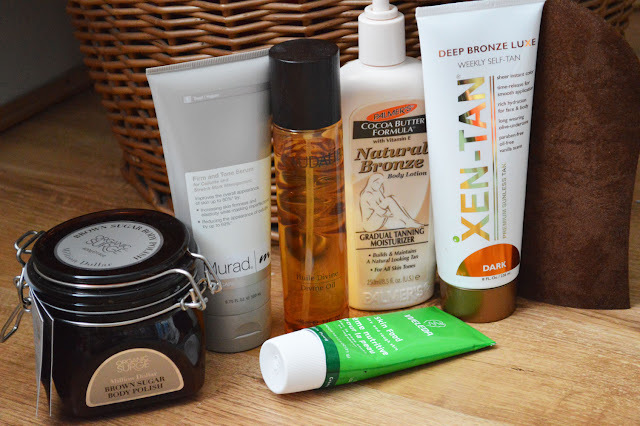 My favourite high street version is the Palmers Gradual Tanning Moisturiser. Boy does this one work, so much so I still forget to wash my hands after each use and end up with tanning marks! I love the smell, I love the pump, I love the rich formulation, I just love everything about this and have repurchased this many times. 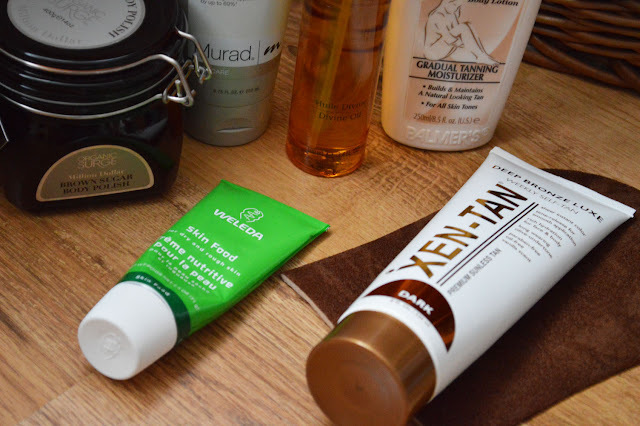 However if I'm after a deeper tan I reach for the Xen Tan Deep Bronze Luxe, it smells of sweet vanilla and does the job perfectly. You go to bed smelling of cupcakes and you wake up looking like you've been on a Caribbean cruise. If only hey? Finally just a little extra, Weleda Skin Food is amazing for dry areas. If my knees or elbows are exceptionally dry or scaly I always pop a little bit of this on first and massage well before self-tan application. I'm wishing for warmer weather, what are you wishing for?